Taky Kimura was one of Bruce Lee's first students when the latter began teaching martial arts in Seattle in the late 1950's. Kimura, now 71, was older than Lee and the other students in the training group, yet became close friends with Bruce and shared many moments with "The Dragon" away from the martial arts, philosophizing on life. Kimura, talking for the first time with Black Belt magazine, reveals in the following Dragon Spirit column how Lee not only taught him how to defend himself, but helped improve his self-esteem and his overall outlook on life after Kimura spent five years in World War II internment camps. after five years in internment camps during World War II. I met Bruce Lee in 1959, when he first came to Seattle. I had always been interested in the martial arts, and I had a little experience in judo. One day a friend of mine came by and told me about a man down in Chinatown who was performing a martial arts exhibition. My friend told me, "You've got to see this guy. He is just phenomenal." So I made arrangements to meet Bruce. At that point in time, heand his students were just training in backyards, in parks, or wherever they could find room. They invited me to watch their work out. When I got there, they told me to throw a punch at Bruce, or use any other moves. I felt the force of the wind against my face after I missed and he counterpunched, even though he didn't come that close to actually hitting me. It was just a very devastating and fearsome event. I knew immediately that I had to [train] with him, because he war such an incredible force. 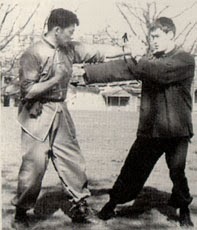 Bruce had background in many martial arts systems, but he was more closer, affiliated with wing chun [kung fu]. Bruce thought it was very practical in terms of fighting. Plus, it lacked the wasted motion found in other systems and had more realism. I think he based his concepts of fighting on that system more than others. When he began teaching wing chun he would modernize it in his own way. Anything that was not realistic, he discarded. He taught usthe things he felt were most practical. He put us through drills that made us feel like we were going to drop. But he made us realize that we had to do it with greater determination. I was 20 years older than Bruce, and at the beginning, he had alot of those attributes that typify teenagers. He was a very energetic person, and always seemed to be in perpetual motion. I had spent more than five years in internment camps in California and Idaho [during World War II], and my whole mental attitude was one of a beaten person. I had a whole different concept of things than Bruce did. I couldn't be around him too often, because it just didn't fit in with my mental attitude. But as time went on, I realized that this young man was endowed with a very strong understanding of Taoism and Zen. One minute he could tell you the raunchiest joke you ever heard, and the next minute he could be philosophizing Zen and Taoism. It would just blow your mind. Even though he was much younger than me, I felt he offered something that I needed. So we became very close friends. Part of that may be because we are both Asians, and maybe there was a strong cultural bond between us. I know that my martial arts ability was far from the reason for Bruce and I becoming close friends. I remember on one occasion, I was training with these guys who were all at least 10 years younger than me. I was working my hardest to keep up with them and I felt like I was gaining confidence. And I was kind of looking out of the corner of my eye, to see if Bruce realized that I was making some progress. Then I heard him say to one ofthe guys, "He'll never make it." I have that cultural background that the Asians have—a certain amount of pride within ourselves —and I think that automatically took over and it made me work like heck to keep up with the others. I wanted to prove to him that I could make it. Bruce was very helpful to me in many ways. He took me from a low point of self-esteem and made me realize that I was a human being and that I am just as good as any other person, but yet no better. I owe him a lot for that. Bruce left us with another message: that the most important thing was to live the philosophy that we adhere to. Fisticuffs just open the door, the upper echelon, of life. The more meaningful part is the spiritual, philosophical essence of what you are.Until you analyze yourself and realize what that means to you, you can't really relate to other people on that kind of a basis. Because Bruce has done so much to revolutionize the martial arts and has done so much for the world in general in that regard, his name shouldn't be muddied up or contorted in any way. We owe that to him. I think if Bruce were alive today, he would still be making a lot of changes. A lot of people have asked me "If Bruce were alive today, how would he keep up with all the changes in the martial arts?" He had a keen mind and a real flexibleness about him. He could look at something and move with it. I know that if he were alive today, he would still be astounding us with a lot of ingenious things.